Since the beginning of time art has been of spiritual significance and was often thought to have magical properties. Quantum physics explains that we are all pure energy vibrating at different rates, and many medical scientists have documented that both thoughts and feelings have an enormous effect on our overall wellbeing. They now recognize that inspirational art and music have therapeutic effects. 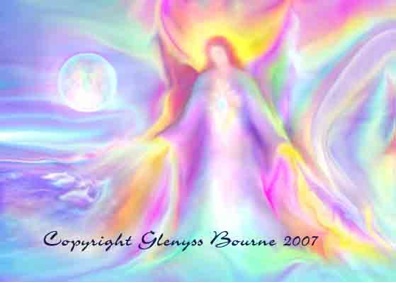 Glenyss Bourne's Angel Paintings exude the energy of deep peace and harmony to lift the vibration, and to activate the connection to the Higher Self and to the Angelic Realms. These Energy Paintings may be used to lift and clear the energy vibration wherever they are placed. They amplify healing and provide Spiritual Protection, helping to dissipate fears and anxiety. 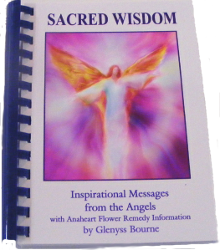 Glenyss' Angel paintings now hang in the healing rooms of many health professionals and the results have been extraordinary, they seem to enhance the healing experience for both the healer and client. 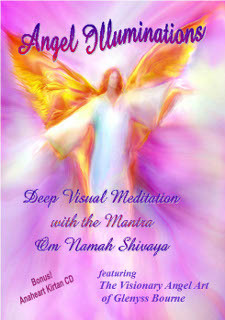 Just sitting with the Angel paintings is a deeply meditative and healing experience. In late 2007, Glenyss was interviewed by Colleen Bate for issue 11 of the magazine Digital Reproduction. A PDF copy of the article can be seen here. Since Glenyss paints digitally using the light technology of the computer (because this most closely matches the quality of light in the Angelic Realms, there is only a digital original. 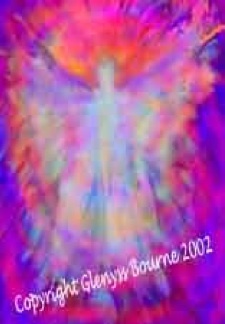 This means that the Angel Artwork may be reproduced in different sizes on paper or on canvas. Each print is individually hand printed and blessed, signed and dated by the artist. The Angelic Artwork is reproduced with archival materials using the Giclee digital printing process and will last for many years. Each large painting comes with its own Certificate of Authenticity. The Paintings are carefully packed in shipping tubes ready for framing or stretching. We use Archival Fine Art Paper and Canvas. * Note: sizes are only approximate due to different aspect ratios.